When you think of a muffin, what type of muffin generally pops into your mind? Was your answer blueberry? Mine was. Well muffins aren't just for breakfast anymore. I am here to introduce you to a savory muffin. This Christmas, Meredith and I each received the cookbook Cupcakes & Muffins cookbook from our dad. This tiny book is jam packed with 100 recipes so I decided it was time to get started. 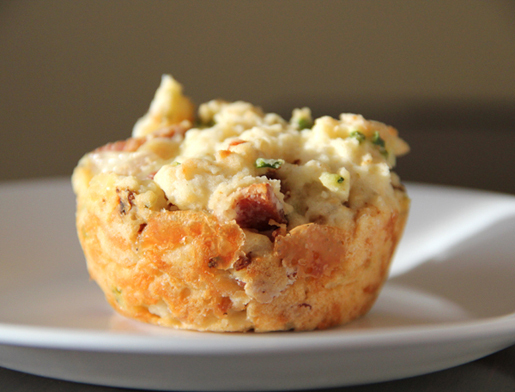 My first muffin was the Buttermilk, Cheese and Bacon Muffins. What doesn't sounds good about that? This little baked delight is reminiscent of a biscuit, but so much easier. No rolling or cutting required. What makes this an extra special treat is the gooey, melted cheese in the middle. It is an unexpected element that ads depth and flavor. I would pair this muffin with a good soup, stew or even on its own. Preheat oven to 350 degrees. Lightly grease a muffin pan. Sift flour & baking powder into a large mixing bowl. Stir in parmesan, bacon and chives. Make a well in the center of dry ingredients. Combine buttermilk, butter and egg. Stir into dry ingredients until just combined. Spoon into each muffin cup until each cup is 1/3 full. 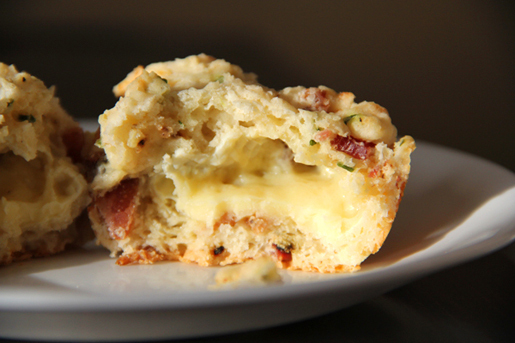 Add a piece of the camembert to each muffin and top evenly with remaining mix. Bake for 25 to 30 minutes, until the center of the muffin springs back when pressed. Cool in pan for 5 minutes, then transfer to a wire rack. Serve warm or reheat gently before serving.